Three has called on Ofcom's chief executive, Sharon White, to live up to her promise to be a consumer champion by imposing a 30% cap on the amount of mobile spectrum any one company can own. Ofcom CEO Sharon White's true identity? 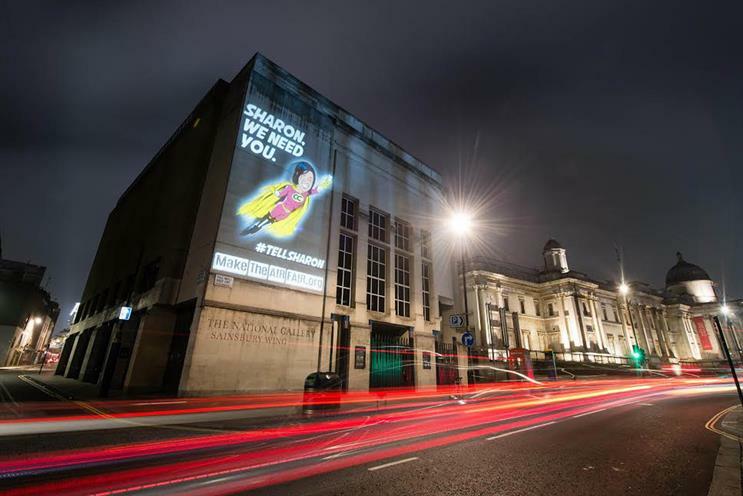 The mobile network is imploring White to live up the hero inside herself by projecting a superhero cartoon version of her on to a series of landmarks and buildings across the UK, including the Tate Modern, National Portrait Gallery, and the offices of BT as well as locations in Manchester, Cardiff, Bristol, Newcastle and Glasgow. Three is also sending a "human drone" of White in full superhero garb to six UK landmarks: Loch Ness, the Angel of the North, Brighton Pier, Harlech Castle, the Eden Project and the Giant’s Causeway. There will also be smaller stunts, including clean graffiti messages outside Three stores and high footfall areas in London, Bristol, Cardiff, Newcastle, Manchester, Slough, Maidenhead and Glasgow. Lianne Norry, director of brand and comms at Three, said: "We felt that there was some fun that could be had with this and we wanted to elevate Sharon and her role in this decision. We see her as having a great opportunity here to prove her customer champion credentials and urge her to make the air fair. "The range of creative activations see us campaigning at grassroots level to really grab consumer attention in a fun and engaging way. We needed something that would catch people’s attention enough to get them to take action and support this important cause. So come on Sharon, we believe in you." Along with Three, the campaign is supported by TalkTalk, CityFibre, the Federation of Communication Services and Gamma. The agencies involved are BPL (creative), Mindshare (media), Vision Nine (experiential), Cow and MWW (PR). The campaign, "Make the air fair", is aiming to draw attention to the disparity in the proportion of the spectrum controlled by the UK’s four mobile networks. BT-owned EE currently controls 42%, far ahead of second-placed Vodafone, which has 28%. O2, meanwhile, has 15%, and Three just 12%. Three argues that this situation hurts competition because it limits Three’s ability to win more customers by offering better prices. Ofcom will next year auction 190 MHz of spectrum, which will increase the total mobile spectrum available by 29%. The new spectrum will be in two bands, one of which is usable by current devices, with the other identified as central to the rollout of 5G. Three wants Ofcom to use the auction to level the playing field by limiting the amount of spectrum one company can own to 30% of the total available. It is calling on consumers let White know they agree by sending her a direct letter. A 30% cap could effectively be advantageous to Three, O2, or new entrants when bidding for spectrum. BT could be forced to sell some of its spectrum, while Vodafone would be restricted in its ability to bid for more.